These teen weight loss tips will help you keep on track as you shed those excess pounds. Following a diet made up of natural whole foods will allow you body to find its natural weight. If you are overweight you will lose pounds, and if you are underweight you will be able to gain. •	The important thing to note is that this not an all or nothing proposition. Simply add as many raw fruits and vegetables into your diet as you can, which will leave less room for all those unhealthy foods. Even steaming vegetables is a great way to get super nutrition. •	Make a clear plan with a list of foods that are never ok, some that are ok on occasion, and what the main bulk of your diet should consist of. That way in times of crisis you’ll have a road map to safely guide you through the situation. •	Don’t let yourself get hungry. Always carry a snack with you so you won’t cave at a moment of hunger. Always carry several pieces of fruit, carrot or celery sticks, a few nuts or seeds, or leftovers from a previous raw meal. •	Slow down. Chew your solids until they are liquid, and swirl your liquids around your mouth for at least 5 seconds before swallowing. Good digestion absolutely requires that we chew our food very thoroughly. Un-chewed food is undigested food which means no nutritional value and more of a strain on the digestive track to expel this waste. Also as we eat slower, we’re less likely to over eat as the stretch receptors in our stomachs are not working on real time, but rather have a slight lag time. •	Don’t over eat. Eat only until satiated, but not to the point where you feel stuffed. This is key to enjoying good health and one of the most important teen weight loss tips. •	Allow your prior meal to completely digest before you eat again. This one principle will do a lot for controlling your weight and making you healthier. If you feel hungry and it hasn’t been more than a couple of hours since your last meal drink a little water and see if you just weren’t thirsty. •	Always try to choose the foods with the least amount of processing. The fresher the better. Stay away from fast foods and soft drinks, and anything with high fructose corn syrup (HFCS) for that matter. HFCS is a major cause of weight gain and a promoter of type 2 diabetes. •	Try to handle the peer pressure as best you can. Perhaps you can find a friend that will embark on your new lifestyle experiment with you. If you do on occasion slip or choose to eat something not on your list of good foods don’t sweat it. It’s not a big deal. Just get back on track with your next meal and don’t feel bad about it, just let it go. •	Get some form of exercise daily, even if it’s only walking. Exercise is critical to good health, weight loss, and making the teen weight loss tips work for you. To view fast weight loss tips for a healthier you go here now. 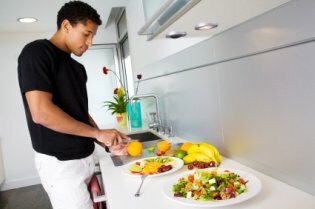 Now that you have read through the teen weight loss tips here are some great tips for getting started.